1. Ask your co-authors for permission to self-archive the article. Please refer to Hanken's commitment to promote open research. 3. When you submit a manuscript to a journal, keep a copy of the final, post-print version (author accepted manuscript, AAM, i.e., the peer-reviewed manuscript). When you report a new accepted publication in Haris, upload this final, post-print version to Haris. [Reference in APA or Harvard style] available at http://dx.doi.org/[add the DOI number, e.g., 10.1002/asi.22963]. The version of the document (Document version). The recommendation is to upload the Accepted author manuscript - Peer-reviewed version, and not to upload proofs or final published versions. Please see more information about Which version of the article can I self-archive. Set the level of public access to your electronic version (Public access to file). If there is embargo, the date before which the document should be unavailable (Embargo end date). Under which license the document is made available (License to document). The Library also checks the publisher's copyright policy. Note that there are also some publishers that do not allow Green Open Access at all. When the library has approved your article in Haris, the document will automatically be moved to DHanken if no embargo needs to be added. In Haris the link to the Open Access version in Dhanken is automatically generated. The article is visible in DHanken in the collection Publications syncronized from Haris and linked to the subject’s collection. If there is an embargo period, it will not be moved before the embargo end date has passed. The administrator of DHanken will check the publisher's open access policy once again and add the text mentioned above, if it is missing. The administrator of DHanken also has the right to delete the document if it is a version not allowed. In that case the researcher will be informed. An uploaded manuscript in Haris is not automatically available online and you do not break any copyright agreements by uploading a manuscript to Haris. Once the manuscript is uploaded, the library staff will check the copyright restrictions of the journal in question. The manuscript is then made available online according to the conditions stated. In most cases where the publishers' own PDF version cannot be made available as open access, journals still allow making a copy of the final, submitted manuscript available as open access, in some cases after an embargo period. When a record is validated and approved of in Haris, the article is transferred to Dhanken for long time preservation and access, and a permanent link is assigned to it. Embargoed articles are made visible when the embargo time is up. [Full reference in APA or Harvard style] available at http://dx.doi.org/[DOI number, e.g., 10.1002/asi.22963]. The Ministry of Education and Culture requires the universities to report the number of OA publications in the yearly reporting of publications, gold open access publications as well as self-archived copies. For self-archived articles of the types A1-A4 only post-print versions (i.e., the peer-reviewed manuscript) may be reported, since the articles in these types need to be peer-reviewed. According to the guidelines for publication awards "the articles (A1 & A2) must also have a post-print version uploaded into Haris (=the last accepted peer-reviewed version which has been sent to the journal)." See Rewarding of scientific publications. As a consequence of the above, we recommend that the post-print version is uploaded in Haris. 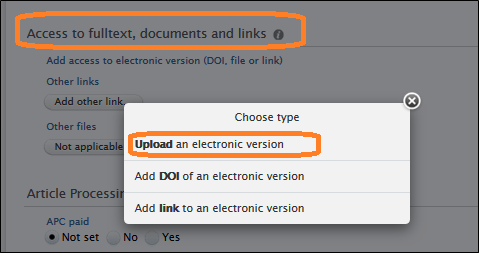 If the post-print, for copyright reasons, may not be stored in an open repository, the author may upload a pre-print version in Haris, if he/she chooses to do so. For questions on self-archiving at Hanken, please contact haris@hanken.fi. Which version of the article can I self-archive? Author's submitted manuscript, not peer-reviewed. Most publishers allow self-archiving without embargo. The refereed manuscript. The author’s final version of the peer-reviewed article accepted for publication but not yet laid out for publication by the publisher. Tables and illustrations may be found at the end of the manuscript or as a separate file. Most publishers allow self-archiving, but an embargo is required by some publishers. The proof often partly has the layout of the journal. Self-archiving is therefore not allowed. The final published version with the layout of the journal. As a rule, self-archiving is not allowed. Even if the journal has an embargo for self-archiving, you should upload a post-print version in Haris. When uploading please do the setting for the article version. The library checks the embargo period and do the embargo settings. As soon as the embargo period is up, the article will be openly available in Hanken's repository Dhanken. ﻿solves confusion arising from name changes, researchers with the same name, or different ways of writing a person’s name. It is useful to give your Orcid ID, for example, in funding applications, submitted manuscripts and CV. It will be possible to activate Orcid also via Haris. Publications can then automatically be imported from Scopus to Haris, which will diminish the need for manual registrations in Haris. This function is scheduled in autumn 2017. More information will follow. You can get an Orchid ID already. Learn more about Orcid.